Coming off the Russell Crowe thriller The Next Three Days, Crash writer-director Paul Haggis returned to the world of interwoven stories with Third Person. Premiering at Toronto International Film Festival last fall, the drama will stop by Tribeca this month before it heads into theaters in June and today the first trailer and poster have landed. Tracking three different couples, in Rome, New York and Paris, the ensemble includes Liam Neeson, Mila Kunis, Adrien Brody, James Franco, Olivia Wilde, Maria Bello, Kim Basinger and Moran Atias. The initial buzz was far from strong for this one and this brief preview certainly seems over the top. One can check out the U.S. trailer and poster below. Third Person tells three stories of love, passion, trust and betrayal. The tales play out in New York, Paris and Rome through three couples who appear to have nothing in common and only tangential connections. But there is always a third person in any relationship — perhaps not romantically, perhaps you aren’t even aware of their existence, but they are there. At its heart, Third Person is much more than a collection of love stories — it is a mystery; a puzzle in which truth is revealed in glimpses, and clues are caught by the corner of your eye — and nothing is truly what it seems. 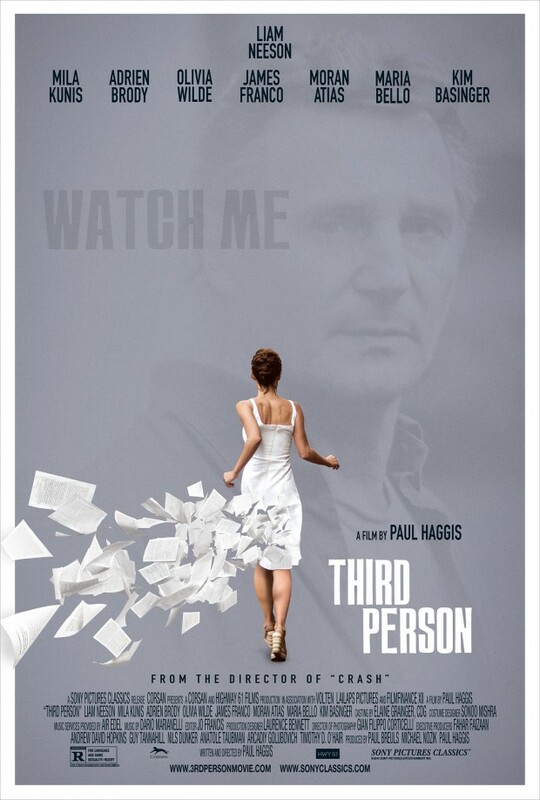 Third Person will hit theaters in June.